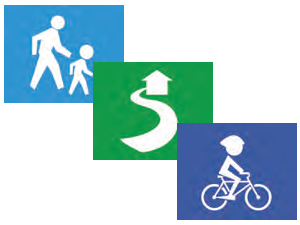 Safe Routes to School (SRTS) is a federal, state and local effort to enable and encourage children, including those with disabilities, to walk and bicycle to school – and to make walking and bicycling to school safe and appealing. The goal of New Jersey’s SRTS Program is to assist New Jersey communities in developing and implementing projects and programs that encourage walking and bicycling to school while enhancing the safety of these trips. Engineering-Focuses on operational and physical improvements around the school to reduce speed and pedestrian/vehicle conflicts. Also includes the improvement or creation of safe, accessible crossings, sidewalks, walkways, bikeways, trails and bicycle parking facilities. Enforcement-Law enforcement professionals will ensure that traffic laws are obeyed near schools. They may initiate a crossing guard program, etc. Education-Through educational SRTS, children and parents are taught about a broad range of transportation choices, including lifetime bicycling and walking safety skills and driver safety. Encouragement-Activities and events that promote bicycling and walking to school will encourage more children and parents to do so.